In 2007, Joanna Barsh led a team at McKinsey & Company to answer that very question. In the process, they uncovered what distinguishes leaders who are successful from those who achieve true greatness, developing an approach called Centered Leadership. They drew on research from across the academic fields of leadership, organization behavior, neuroscience, evolutionary psychology and positive psychology. In addition, Barsh interviewed over 160 leaders from many fields – including business, government and the arts – and from many countries. With quantitative research, the team learned that these leaders have mastered practices to find their balance in the midst of chaos and lead from their most resourceful selves, unleashing the potential of others. In 2009, Johanne Lavoie joined to lead development of programs that help executives build these capabilities. Their research and development work continues as more and more leaders experience Centered Leadership. In the business bestseller, How Remarkable Women Lead, Barsh described Centered Leadership’s five capabilities and the research that underpins it. Here, with colleague Johanne Lavoie, Barsh provides a practical, actionable field guide for implementation. JOANNA BARSH is the author of the business bestseller How Remarkable Women Lead and director emeritus at McKinsey & Company. At McKinsey, she led the creation of Centered Leadership in 2008. Joanna now helps governments and businesses grow the global community of Centered Leaders. She has spoken to groups in over 20 countries, including Australia, Brazil, China, France, Indonesia, Malaysia, Saudi Arabia, Sweden, and the U.K., and Fortune 100 companies such as Citi, Danone, GE, Google, Time Warner, and Walmart. She has been featured by the Wall Street Journal, Forbes, FT, Businessweek, and more. Joanna holds an MBA from the Harvard Business School where she was a Baker Scholar. JOHANNE LAVOIE is a senior expert in McKinsey’s organization practice; she serves as the dean of the Centered Leadership Program, the global leadership course for senior executives. Johanne mixes twenty years of business consulting with expertise in adult development and organization culture at Fortune 100 companies. In addition, Johanne serves on the advisory board and faculty of the Banff Leadership Center. She has an MBA from the Harvard Business School. "Centered Leadership is a personal and practical roadmap to taking on the challenge of leadership." "Many have tried to define the common characteristics of leadership, but few have applied the rigorous, research-based approach that Joanna Barsh takes in Centered Leadership. The result is a book that is both authoritative and actionable." - Dan Doctoroff, CEO & President of Bloomberg L.P.
"During in-depth interviews with over 165 men and women, [Barsh] gathered data on thriving and rising at work; she then articulated her new model for thinking about leadership development in two books: How Remarkable Women Lead and the upcoming Centered Leadership. They should be required reading for every young person- man or woman." "Centered Leadership is the essential leadership guide for our times, as it puts personal development at the center of the corporate leadership endeavor. Here's a program that transforms your work and life balance from a challenge into a strategy." 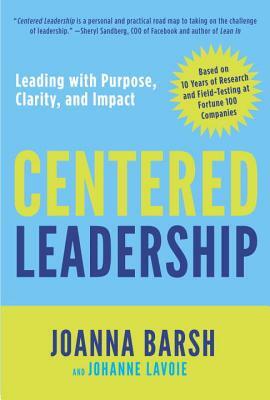 "In Centered Leadership Joanna Barsh has given us a highly effective guide to building the more comprehensive, often deeply human, leadership skills that this complex, fast paced era requires."